Native to the Americas. 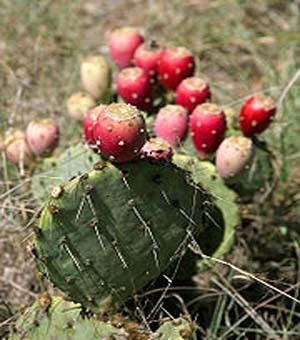 Opuntias are perhaps the most widely distributed cacti, with a multitude of species. Very bold and sculptural in form. The flat rounded pads usually have two types of spines. Large, smooth, and fixed or small and hairlike, called 'Glochids'. Grow in dense, tangled structures and produce fruit known as 'Tuna', which is edible. Opuntias are some of the toughest and most tolerant plants in arid climates. We are dedicated to growing the best plant material appropriate to the desert southwest at a fair and competitive price. Our vision began with Sierra Vista Growers in 1987 with a simple mission, "to be a full service wholesale/retail nursery that provides our region with plants appropriate for the Chihuahuan desert."